We are so excited to bring Prosperity Candles to Herbal House Products. They are unique candles hand-poured by women artisans and refugees who are seeking a better life for themselves and their families here in the U.S. The candles are created from a soy blend wax, have premium fragrances and use natural wicks. No dyes or enhancers are ever used. Each candle comes in an ethically curated gift box, perfect for any occasion. Inspired by the beauty of nature, these uniquely scented candles capture the spirit of the Pioneer Valley of western Massachusetts. "It is not enough to talk about peace. One must believe in it." Eleanor Roosevelt's words resonate as much today as during her lifetime. For the people of Aleppo and throughout Syria, a candle symbolizing peace and light out of darkness. Created to honor the victims and support families stricken by the October 17 shooting at the Tree of Life Synagogue in Pittsburgh, this candle symbolizes the strength of unity over hate, a community standing in solidarity against anti-Semitism. 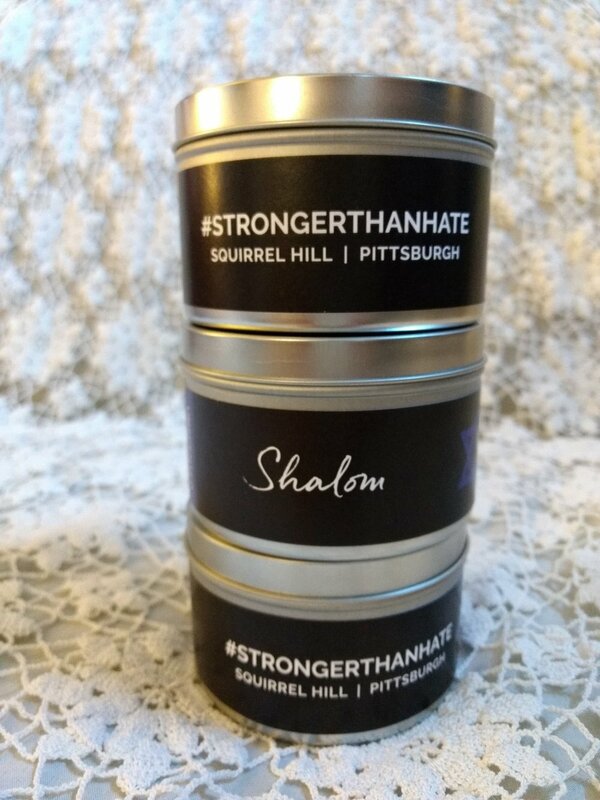 With every Tree of Life candle purchase, Prosperity Candle donates 100% of net proceeds to the Tree of Life Synagogue family fund and Uncover Squirrel Hill, an organization providing programming to bring the community affected by the tragedy together. Inspired by a rescue pup at Prosperity Candles, a Wet Dog candle will bring the scent of pine forests inside with Blue Fir and Spice. Or maybe you prefer the freshness of Spearmint and Eucalyptus? How about luscious Lemon and Lavender? Burn time 50 hours. This was a set of five. Now being sold individually. Candles are made of soy. Named for Riley, who once in awhile gets herself soaking wet, but never smells bad because her fur picks up the aroma of whatever candles are currently being poured in the shop! Try Blue Fir and Spice, Lemon and Lavender or Spearmint and Eucalyptus.